I have been reading about chimichurri for a couple of years now. Native to Argentina but enjoyed throughout South and parts of Central America, it is used both as a sauce for grilled meats and as a marinade. 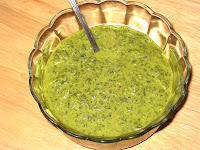 The main ingredients are parsley, cilantro, salt, garlic, oil and vinegar. Other ingredients are added to the taste of the individual preparing it; there are apparently as many recipes out there as there are chefs who make it. I have had a skirt steak biding its time in the freezer for a few months now. I am happy to say that I am finally making real progress on using up everything that's in there. I haven't bought any meat for weeks, and I am determined to use up all of my frozen meat before I buy any more. I think I am down to a pound of ground beef, two halves of a ham bone, and another skirt steak. I think that's all. Considering what all I did have in there, that's pretty amazing. While the skirt steak was defrosting in the refrigerator, I thought about how I wanted to prepare it. It's a flavorful cut of meat that doesn't really need a lot of seasoning and, while related to flank steak, is less lean and doesn't really need the marinade to tenderize it. 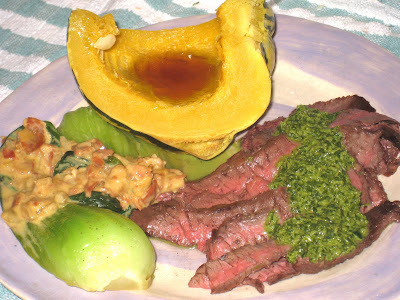 I remembered watching Ingrid Hoffman make a skirt steak that she served with chimichurri, and she made a point of saying that she didn't season the meat with anything more than salt and pepper; serving the sauce with it provided more than enough flavor. So I decided that's what I would do. After the steak was defrosted I rinsed it off and patted it dry. Instead of putting it under the broiler, I decided to cook it in my cast-iron skillet on the stove. 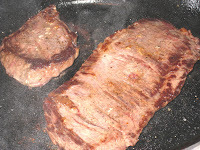 I turned the heat on high, poured a little bit of canola oil into the pan and let it get just to the verge of smoking hot, seasoned the steaks with salt and pepper, and gently lowered them seasoned-side down into the pan. I didn't touch them while they cooked for three minutes on the first side. Then I seasoned the top sides and gently turned them over and let them cook on that side, untouched, for another three minutes. When they were done cooking, I put them on a plate and let them rest while I threw together the chimichurri. When everything was ready, I sliced the meat as thin as I could against the grain. If the chimichurri in this picture looks lighter than that on the steak in the photo above, that's due to the inconsistency of my camera. What's on the steak is closer to the actual color. It came out dark green and very flavorful. I used sherry vinegar, which I have come to prefer over regular red wine vinegar. The parsley is fresh and bright, and the garlic actually tones down the acidity of the vinegar. It really is all you need to make the skirt steak delicious. I'm also thinking it would be really good with potatoes. Like I said above, I found many recipes online for this sauce, in addition to one I found in a South American cookbook. Much like I did with the za'atar, I used all of them as a springboard and came up with my own version. I don't know that I will do much, if anything, different the next time I make it. Instead of messing up the blender, I put all of the ingredients in a jar and blended them up with my super-duper hand blender that I am always talking about how much I love. You do have one by now, don't you? Place all ingredients into a blender. Puree until well blended. Or, put everything into a large jar and use the hand blender.